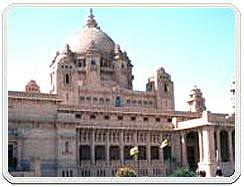 The ruling family of Jodhpur has newly converted a part of the gigantic Umaid Bhawan Palace as a palace museum. Items on show are uncommon group of rocks, watches, fine china, ornate mirrored furniture, glass and crystal ware, photographs etc. The visitor gets access to the grounds and division of the Umaid Bhawan, one of the biggest private homes in the world.